Discovering one of her sons had a life-threatening allergy to nuts and eggs catapulted Alice Sherwood into the bewildering world of "food allergies." How can you make a birthday cake without flour? What happens to family meals when packaged foods, which may contain traces of nuts, along with pasta, bread, and peanut butter become forbidden? Suddenly it became crucial to find alternatives, but most "cooking without" recipes lacked taste or contained unfamiliar ingredients that were hard to find. So Alice, armed with a lifelong love of food, got to work in the kitchen and devised her own recipes. The Allergy-Free Cookbook is unique. There are no dismal, "special diet" versions of recipes, which don't work. Instead there are dishes from around the world that center on ingredients other than eggs, dairy, gluten, and nuts. Throughout, Alice gives several variations for each recipe. So a nut-free cake that uses butter, for example, may be adapted for the dairy-free crowd by using soy spread. This guide has more than 100 recipes for meals, snacks, and lunch boxes as well as for suppers and birthday parties. All the crowd-pleasing favorites are here. By experimenting with polenta and potato flour, for example, Alice has invented a gluten-free crunchy shortcrust pastry that's superb in apple tarts, while rice, potato, and tapioca flours combine to form a dough that works a treat for French bread. 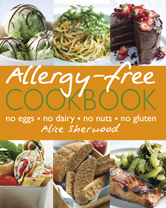 With the Allergy-Free Cookbook, everyone's invited to dinner! For the first section of the guide, the author draws on her experiences of diagnosis and coming to terms with allergies in her own family to give readers the low-down on the allergy world. Fascinating facts are interlaced with topics such as allergy etiquette - how to smooth your path in schools, restaurants, and at dinner parties and how to respond positively to people with allergy. A tour of allergy-free world cuisine opens up the options for cooks and diners while "Your pantry" gives invaluable advice on convenience foods, packaging, and quick-fix substitutes. There are also tips on catering for childrens' parties and other tricky occasions.